Price from: $215 - Book now! Welcome to Siem Reap the gateway into the legendry Angkor temples. On arrival at the airport, you will be greeted by our tour guide and driver and taken to your hotel to check in. Time for refreshment followed by a lunch at a local restaurant. 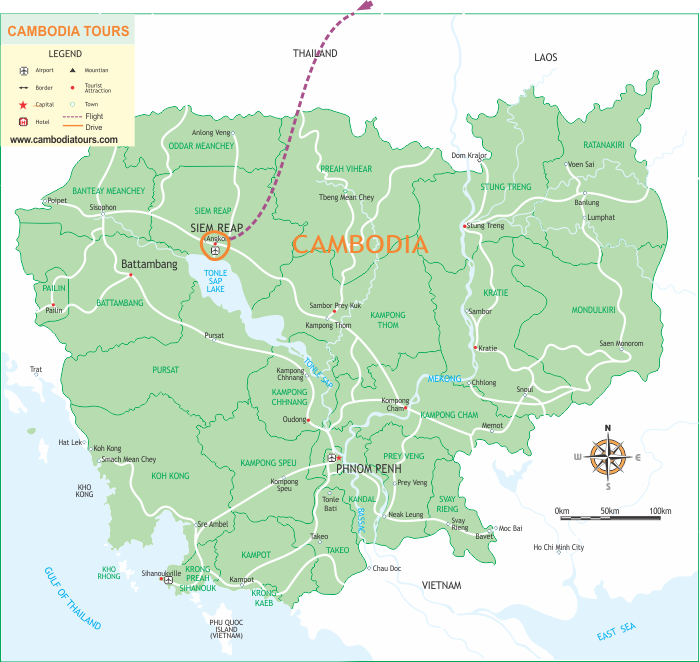 The afternoon exploration starts with a visit to the ancient capital of King Indravarman I (877-889), now referred to as the Rolous Group and best known as the birthplace of the classical Khmer art and architecture. Then, drive to Banteay Srei, regarded as the women’s citadel and home to Angkor’s finest stone carvings. Your trip continues to Preah Khan (Sacred Sword): one of Angkor’s largest temples, constructed in the 12th century by Jayavarman VII. Later this afternoon, you will return to the hotel where you will spend your time on your own. Wake before dawn and take a tuk-tuk ride to visit the magnificent Angkor Wat - the largest Khmer temple and finest example of Angkorian art and architecture. Dawn is one of the most beautiful and haunting times to visit the temples, whose ancient sandstone blocks are painted gold by the early morning rays. For your most convenience, a table with hot tea or coffee, breakfast box arranged by Travel Cambodia will be served right on site of Angkor Wat. After breakfast we continue the visit to the jungle-entwined temple, Ta Prohm. In the afternoon, head out of town and embark on a short cruise along Tonle Sap Lake to visit the local floating villages. On the way back to your hotel, we will stop to watch the sunset from the foot of Phnom Krohm Mountain. After breakfast, spend the morning exploring the ancient fortified capital, Angkor Thom. Nearly 10 sqkm in size, this city once housed a population of over 1 million people. Start your tour with Angkor Thom’s imposing South Gate, topped with the four serenely smiling faces of Avalokiteshvara. Next, visit Bayon temple, the Elephant Terrace and the Terrace of the Leper King. Return to Siem Reap center in the afternoon and explore the Psar Chass, also known as the “Old Market,” for some last minute souvenir shopping, before driving to the airport to catch your departure flight home. Bon voyage!